John Smith Richardson, my father, was just 44 when he died in Melbourne, Australia, on April 9, 1954 - the 18th anniversary of his marriage to Rena M. Cox. It was an age when cancer was talked of in whispers or not at all, especially if the cancer that killed my father was testicular cancer. It was also a time when treatment was often rudimentary with little chance of recovery. There was also little effective palliative care. Hence, my father's year-long illness was inevitably terminal and, though he complained very rarely, it was often distressingly painful. John, known to his Scottish family as "Jacky", was born in Glasgow on December 14, 1909, and was joined in 1912 by a brother, Edward, universally known as "Ted". Life in Scotland was austere with low wages and high unemployment. John's mother, Elizabeth, or "Bessie", my beloved Nana, worked as a domestic servant, while his father, also called John Smith Richardson, was an engineer, mostly working in coal mining. John Richardson Snr emigrated to Australia early in 1913, hoping to find a better life for his family, who were left behind in the Glasgow area. His hopes were dashed by strikes and periods of unemployment and then by the outbreak of the First World War - "The Great War" - in 1914. John Snr joined the Australian Imperial Force (AIF) and was sent to Egypt. But he became seriously and chronically ill and was declared unfit for active service without ever having fired a shot in anger. He was evacuated to England to recuperate and while there was reunited with Bessie and the two children five years after he set out for Australia. John Snr was later discharged from the AIF and transferred to munitions in Scotland. He was sent to Inchinnan, just outside Glasgow, with the family to work as a wireman, then chief inspector, on the construction of the R34 airship, the first such craft to successfully cross the Atlantic in both directions. On demobilisation in 1918, John Snr returned to Australia, gaining work as an engineer at the State Coal Mine in Wonthaggi, Victoria. He was finally joined by Bessie, John and Ted early in 1920. John Jnr attended the Wonthaggi State School and studied engineering before beginning a printing apprenticeship with the Wonthaggi Sentinel newspaper. It was during this time that he began some reporting and writing and developed a keen interest in the local Baptist Church, sometimes taking services as a lay preacher. He also tried to become a Baptist Home Missioner, which was a fulltime church post not requiring a theological degree and often used as a stepping stone to becoming a fully-qualified "reverend". John applied for the Hopetoun-Rainbow circuit in the Victorian Mallee, but was rejected. According to Rena, a member of the selection panel didn't care for John's disapproval of British Israelism. Whatever the reason, he was still enthusiastically accepted as a lay preacher and as a Sunday School teacher. A keen interest in music - he was a competent violinist and chorister -- also led to him becoming the Wonthaggi Baptist Church choirmaster for a time. John was the proud owner of a "tin Lizzie", more correctly called a T-Model Ford. This not-entirely-reliable vehicle was taken on many an adventure with his family and friends, often into the hills of Gippsland where John Snr searched for alluvial gold. John's father died of First World War medical complications in 1935 and the car was sold so that John could afford to marry in 1936. 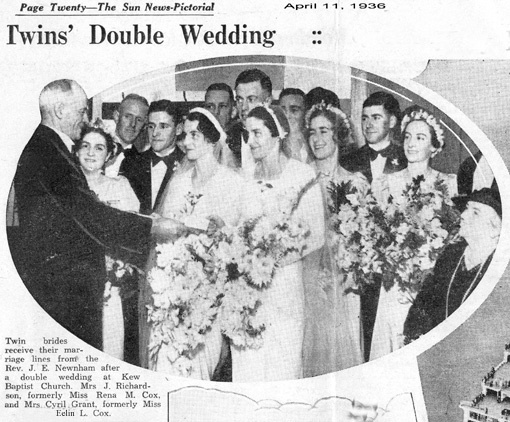 It was a double wedding and was featured in Melbourne's Sun News-Pictorial, with John marrying Rena and her twin sister, Eelin, marrying a builder, Cyril L. Grant. John and Rena had two sons born in Wonthaggi: Ian, then three years later, Jeffrey. When the Second World War broke out, John volunteered for service with the Royal Australian Air Force, but was rejected on health grounds - he had flat feet and had suffered from rheumatoid arthritis - and because he was in a reserved occupation, newspaper production. In 1941, John, accompanied by Rena, Ian and Jeffrey, left Wonthaggi for St Arnaud, in north-central Victoria, to become editor of the St Arnaud Mercury, filling a gap left by Evan Bryan who had enlisted with the Australian Army. The move to St Arnaud meant that he was now a full-time journalist, though his printing skills were often called upon to help with the lay-out of the newspaper. 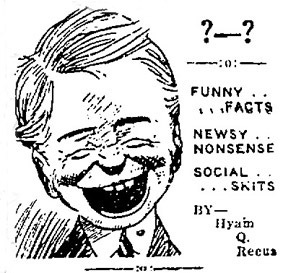 A keenly-read item in each issue of the Mercury was a column allegedly written by Hyam Q. Reeus. It was a humorous, mildly-scandalous account of life in St Arnaud. John never formally admitted that he wrote the column, but everyone knew he did, and at the end of his time in St Arnaud, he described it as having been written "entirely in the cause of humour and on the assumption that a little folly now and then is relished by the wisest men". While in St Arnaud, John and Rena's first daughter, Ruth, was born. In addition to his parental and journalistic duties, John continued to take church services as a lay preacher and joined the part-time citizens' military force, the Volunteer Defence Corps (VDC). He and Rena also played a full part in the town's community life. 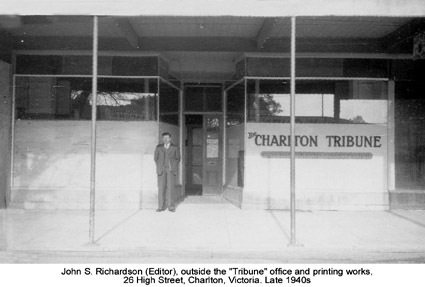 In May 1943, the family moved to neighbouring Charlton when John was appointed Managing-Editor of the Charlton Tribune. His salary was £8 ($A16) a week, plus 20% of any profits. Later that year, he leased the Tribune from the owner, Mr H. A. Davies, a Melbourne journalist. John remained a member of the VDC and one of my earliest memories of Charlton was seeing him doing his weekly shift on watch in a shelter in the local park, scanning the skies with his binoculars for any Japanese aerial intruders. It is safe to say that no Japanese warplanes managed to reach the Charlton area. After the war, Rena gave birth to their fourth child, Alison, then in March 1946, he became proprietor of the Tribune, a purchase that gave him and Rena and his widowed mother enormous pride. Like most rural newspaper companies, a substantial part of the income came from what was known as "job printing" - the production of such items as posters, receipt books, letterheads, business cards and wedding invitations. John did most of the reporting and writing for the Tribune. But he could also often be seen wearing a printers' traditional apron and green eye shade as he assembled pages of the paper and operated the printing presses, assisted by Doug Arundell, his long-serving linotype operator and compositor. Edna Ronald ran the front shop and office and did much of the proof reading for four years until shortly before her marriage to local farmer Edward Parish in April 1954. Edna and Edward heard the news of John's death on ABC Radio while they were on their honeymoon. John did much to liven up the Tribune. Not only did he introduce his readers to the amusements of Hyam Q Reeus, he became a skilled photographer, having taught himself how to do his own processing and printing. 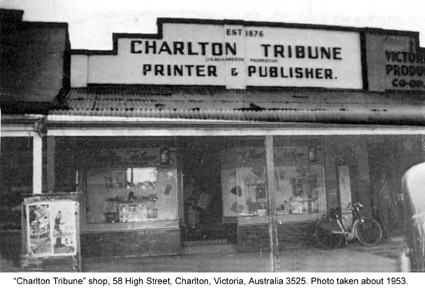 Thus, the Tribune became the first weekly bush newspaper in the State of Victoria, and perhaps the whole of Australia, to routinely feature locally-produced photographs. Initially, John had a large second-hand wooden Speed Graphic that took a maximum of 12 quarter-plate (10.5cm X 8cm) glass or film negatives and required single-use flash bulbs the size of 100 watt domestic filament light globes. Then in the 1950s, he proudly switched to a Kodak Retina, a new-fangled state-of-the-art 35mm camera that could take 36 pictures on a single roll of film. John also modernised the job printing department by adding a new high-speed Heidelberg automatic platen press alongside the pedal-powered machine that had served the Tribune reliably, though rather inefficiently, for many decades. When John was first associated with the Tribune, it was housed in the old two-storey Wylie Building at 26 High Street. The front shop and printing room occupied the ground floor and the family later moved into the residential sections on the top floor and at the rear of the building. Several years later, in December 1950, John vacated the Wylie Building. The family moved into 10 Peel Street, while the Tribune shifted back to its historical roots, 58 High Street, halfway along the main parade of shops. This was where the East Charlton Tribune, as it was originally known, started life in 1876. Though the original building had been mostly replaced, the yard at the rear still had the concrete foundations for the original printing presses. This homecoming for the Tribune had a special poignancy because the seller of 58 High Street was Miss Lillian Klunder, daughter of R. M. Klunder who was a co-founder of the East Charlton Tribune. "Lill" as she was widely known, had run a stationery shop at 58 High Street and the acquisition of this added to the financial viability of the Tribune. John's life was never less than busy and his days were usually long. In addition to running the newspaper and stationery shop, he was, among other things, an elder and the choirmaster at St Andrew's Presbyterian Church, superintendant of the Presbyterian Sunday School and was in frequent demand as a lay preacher at several Protestant churches in and around the district. His sermons were never dull, not least because he would delight congregations not just with his cogent religious arguments but with his jokes and humorous observations on life. There were those who sometimes felt that humour was not best suited to a place of worship, but John would not accept that. And John's church services usually had a bonus for his family: gifts of farm-produced cream or jam from grateful worshippers. 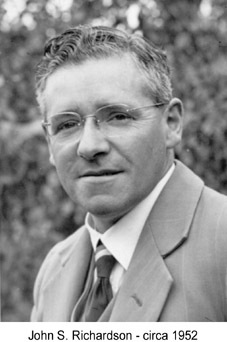 Any assessment of John's contribution to the betterment of life in Charlton must include his leading role in the establishment of the Charlton Music Club in 1948. The club organised many music appreciation evenings and concerts by visiting singers and musicians. It also led to the establishment of a district choir with John as choirmaster. He took this responsibility very seriously. Members of the choir recall that his sense of humour would sometimes fail him as he became impatient with those who sang out of tune or failed to keep the correct time. One former chorister recalls a painful, though unintentionally amusing, occasion when the district choir was accompanied by the Charlton Citizens' Band at a public gathering. This would have been fine were it not for the fact that there were two competing conductors. While John was conducting the choir, the bandmaster asserted his right to lead the musicians. John's face became increasingly red with frustration as he attempted to maintain strict tempo while the bandmaster took a rather more leisurely approach. On top of all these commitments, John played prominent roles in several community organisations, including the Boy Scouts and State School committees. John, though basically a shy and sometimes reserved man, had a sense of humour that pervaded every aspect of his life. This probably helped him fit into a blokeish society that often judged community worth and status by a man's sporting ability, his love of gambling, his often-fanciful tales of sexual conquest and an ability to drink large quantities of cold beer without falling over. John was a dedicated family man with a strong and genuine Protestant sense of what was right or wrong. He didn't smoke. He didn't drink (he wouldn't even allow sherry in Christmas cakes, even though the alcohol would have long evaporated by the time they were baked). He didn't gamble (if he were asked to buy a charity raffle ticket, he would decline but make a donation instead if the cause was a good one). And he never swore or told jokes that were unkind or might be considered dirty, sexist or racist. No doubt there were some who regarded him as a wowser - Australian slang for a prude and killjoy -- but the overwhelming majority of those he dealt with recognised and respected him for what he was: a multi-talented, enthusiastic, kindly and honourable man with a great sense of fun and an infectious giggle. Though John was a devout Christian, he was not an in-your-face proselytiser. He led by example and never judged others who did not meet his own exacting standards. He had many friends who drank, smoked and gambled in moderation and he could often be seen enthusiastically swapping banter and gossip with the local Roman Catholic priests. He came from a family that had a history of Freemasonry. Even his mother was a member of a women's lodge in Scotland. But when John was approached to join the Freemasons in Charlton, he declined on the grounds that he wouldn't have felt comfortable being a "worshipful brother" until such time as his business was properly established and turning a fair profit. He felt that too many men became Freemasons as a means of boosting their fortunes, and he didn't wish to be a part of that self-serving culture. The business was a great financial struggle for him. He could never afford another car in his lifetime, and he mostly walked or rode his bicycle to meetings and reporting jobs. Initially, he didn't even have a radio, but eventually bought a second-hand one that was powered by a combination of mains DC electricity and a 2-volt rechargeable wet battery. The radio gave him great joy. Woe betides anyone who interrupted the news bulletins, Russ Tyson's Breakfast Half Hour or the lunchtime serial Blue Hills on the Australian Broadcasting Commission. Any transgressions by his children usually earned them a roaring "quiet!" -- or a cuff around the ears, if they were me or my brother. John bought the radio from a friend and local baker, Barney Allen, who occasionally treated the family to what was a rarity in the 1940s -- a few bread rolls made from dough left over after the daily order for loaves had been fulfilled. John never acquired an Australian accent. This was at the insistence of his mother, who was intensely proud of the family's Scottish roots. Sadly, there is no known recording of his voice, even though he featured on radio on a number of occasions. He was interviewed about local events from time to time for ABC Radio. He also compéred several radio variety concerts in the Top Town Contest. This was run by the Melbourne Herald and the Sun News-Pictorial and broadcast on Radio 3DB Melbourne and its rural sister station, 3LK, at Lubeck, near Horsham, Victoria. It was in an age when recording tape was very expensive and was electronically "wiped" and re-used after each broadcast, so almost nothing was archived. John's thick, wiry hair turned prematurely grey in his 30s. Like many Scots of his generation, he was not particularly tall - about 5ft 6in, or about 170cms, as I recall - and as a young man, he was as thin as a whippet, though a few years of Rena's enthusiastic cooking soon filled him out. John's mother, Bessie, and wife Rena were two forceful women who didn't always see eye-to-eye. There was, I was told, a significant struggle between the two women about whether I, as the first-born son, should bear the traditional family name, John Smith Richardson. My mother finally won with a compromise that left family honour more or less intact. I was named Ian, on the grounds that it is Scottish for John, with my second name being Duncan, the middle name of Bessie's much-loved elder brother, John McDearmid. What Bessie and the rest of the family didn't know about the traditional family name was revealed more than 30 years later when I began researching the family history. The original John Smith Richardson, I discovered, was the illegitimate son of an itinerant Scottish miner, William Richardson, and a farm domestic servant, Betsy Smith. William later seemed to have disappeared without trace, while Betsy went on to marry someone else. Both my father and Bessie were, by then, long dead, so I was never faced with the dilemma of whether to tell them of my discovery. I think it is reasonable to assume that having been brought up as a righteous Scots Presbyterian lady, Bessie would have been horrified, but somehow I think that John would have regarded it all with some discreet amusement. I hope so. John Smith Richardson. Born Glasgow, December 14 1909. Died Melbourne, Australia, April 9 1954. Of its noble-hearted owner who has gone to his reward. To his loving wife and family who must feel the piercing dart. That if, the world had such today, there'd be no need to sigh. To carry on as he would wish, the systems he proved sound. Learn from those Books of Wisdom in your journalistic room.